IN ENERGY STORAGE, CHEMISTRY RESTRICTS THE POTENTIAL OF PHYSICS. SO WE MOVED AWAY FROM CHEMISTRY AND INVENTED A UNIQUE, HIGH PERFORMANCE, PURE ELECTRICAL ENERGY STORAGE TECHNOLOGY. 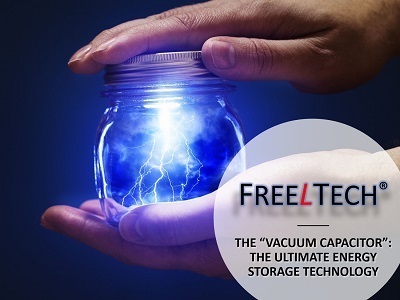 FREEL TECH DESIGNED THE “VACUUM CAPACITOR”, A REVOLUTION IN ELECTRICAL ENERGY STORAGE ! DOWNLOAD THE PRESENTATION / PLAY THE VIDEO. One of our early prototypes. It can store approximately 1 kWh. THE LOWEST COST : well under 100 USD per kWh, right now ! Our storage device, the Vacuum Capacitor, is similar to a supercapacitor, but energy storage is achieved by using new physical principles. Thanks to the patented structural features, our Vacuum Capacitor is able to store charges (electrons) inside a small vacuum chamber, under high electrical field. We create the proper conditions to have these charges packed in very dense, cluster-like structures. Hence, we achieve a volumic storage, rather than surfacic (case of the usual capacitors). Charge and discharge are achieved through a single electrode, the cathode. This is a highly efficient and direct electricity storage, without transformation into electrochemical, or chemical energy. One such prototype Vacuum Capacitor (“VC”), approx. 50 g and 7 cm height, will typically be able to store approximately 1 kWh of energy (charges stored inside the top white ceramic cap, under vacuum). Round-cycle efficiency of the whole system (charging system + Vacuum Capacitor) is currently being tested and undergoing improvement, in order to reach an overal efficiency not less than 95 %. With its simple structure and long service life, our technology offers the most cost-efficient and reliable energy storage solution for most applications. 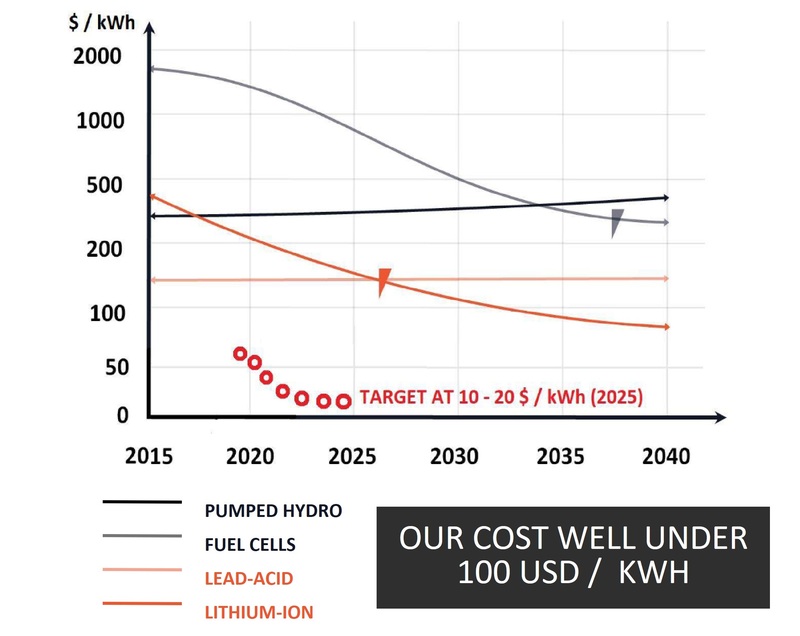 While Li-Ion technology (the battery pack itself) is expected to reach the $ 100 per kWh mark on or before 2030, with current prices closer to $200 /kWh, the cost price of our Vacuum Capacitor (including the associated charging system) is already well below this figure, and will become even lower when its massive production begins. Li-Ion, other electrochemical, Redox Flow, Hydrogen, Power-to-gas, CAES, TES and other technologies will hardly be competitive with our technology, once introduced on an industrial scale. Our Vacuum Capacitor is made of relatively common, non expensive and durable materials (usual metals, ceramics, …): it can easily be produced in large quantities, manufacturing gigawatthours of energe storage capacities at much lower price than in existing or planned gigafactories of Li-Ion batteries. Our technology also allows us to avoid relying on supplies of rare or expensive materials, such as cobalt or lithium, whose prices are currently rising due to their scarcity or near monopoly extraction conditions. It is also known that the exploitation of these raw materials poses serious environmental and sustainability issues, without taking into account the total carbon footprint linked to the total manufacturing and supply chain. Our electrodes are designed to withstand a very large number of cycles. Our current target is to reach 100,000 cycles, which we hope to confirm soon with our current testing program. Our Vacuum Capacitors will have limited individual capabilities, so it is easier to ensure their protection in all applications types : the VCs will each be encapsulated in a specific, reliable physical and dielectric barrier, to prevent current leakage, or damage in case of VC misfunction. If a Vacuum Capacitor fails inside a storage system, its physical protection barrier, earthing (or emergency discharge system) and the system’s PMS shall ensure that it will not prevent other units from functioning properly and safely. The damaged unit will simply be replaced during the next scheduled maintenance. The free-from-electrolyte Vacuum Capacitor won’t catch on fire. Thanks to the use of common raw materials and to their simple structure, discarded vacuum capacitors can be easily dismantled and their components recycled. The Vacuum Capacitor itself is resistant to the harshest weather conditions, such as cold or extreme heat, while most other storage technologies require air conditioning to function properly. In our case, the appropriate temperature range must only be guaranteed for the surrounding electronic components (PMS, I&C, inverters, ...), while the compactness and the energy density of our Vacuum Capacitor make it possible to save money on the significant energy used for air conditioning. FREEL TECH AG. is a Luxembourg-based innovative start-up, established in 2017, which is developing and testing the Vacuum Capacitor technology, covered by several patents since the early 2010’s. Since 2018, the company is in early talks about cooperation for large-scale development of the technology with interested industry players. FREEL TECH has been selected as one of the 21 finalists (out of 235 projects) in the frame of the the "Global electric storage call for Startups", organized by InnoEnergy. The final pitching event for these 21 companies was held in Amsterdam on March 19th – 21st. Download our updated presentation here to have more details about our technology. Various calculations show that the introduction of a high share of renewable, intermittent sources of energy, as well as tens of millions of EVs, show that it cannot be achieved without genuine, very-large-scale energy storage. Typically, tens of TeraWatt.hours may be needed at the scale of only one medium-size country like France, if it wants to reach a close-to-100 % level of electricity from renewable sources of energy. By following current track, we will be quite far from the world’s genuine needs in terms of energy storage, in the case our global energy mix is to become genuinely mostly decarbonated by 2050, as suggested by the latest UN reports on climate change. So we are in urgent need to have better, higher-density, safer, cheaper and more sustainable solutions for energy storage. 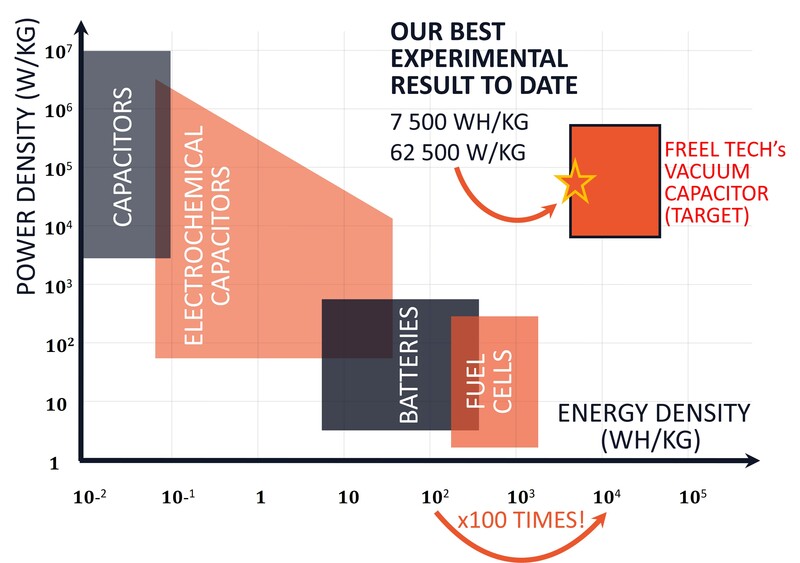 Meet the Vacuum Capacitor, a technology that will definitely change the game in energy storage! ...the share of lithium-ion batteries in the total storage capacity is growing, and it represents a large portion of new installed capacities in recent years, but this technology is reaching its limits (performance, cost reduction) : total worldwide non-PHS storage capacities stand currently at 160 GWh (2017) and will reach (only…) 6 – 8 TWh by 2030 ! Copyright FREEL TECH AG 2019. All Rights Reserved. Please read this Legal Notice carefully before accessing this internet site. The reproduction, distribution, transfer or storage of part or all the contents of the website is prohibited without the prior written consent of FREEL TECH. FREEL TECH grants you the authorization to store on your computer or print copies of extracts from this website for personal use only. The content of FREEL TECH’s website may be used for information purposes only and in such a manner that does not harm the reputation of FREEL TECH. Using any information expressly classified as public is permitted in public communications provided that the source of information is mentioned. In no event shall FREEL TECH be held responsible for any damages whatsoever that may result from the use of, or the inability to use the contents of this website. FREEL TECH AG does not make any warranties about the completeness, reliability and accuracy of this information. Any action you take upon the information you find on this website (www.freel.tech), is strictly at your own risk. FREEL TECH AG will not be liable for any losses and/or damages in connection with the use of our website. The content on this website is provided “as is” and without representations or warranties of any kind, express or implied. This website may include links to other Internet sites that are beyond the control of FREEL TECH. FREEL TECH is not responsible for the content of any such websites. You acknowledge and agree that the use of such websites is solely at your own risk. A link to a non-FREEL TECH site does not imply that FREEL TECH endorses or approves the content on or accessible through such a third-party site. Neither does it imply that FREEL TECH endorses or approves the products or services referenced in such third-party site. All content on this website, and all intellectual property rights thereto, are owned by FREEL TECH and/or its subsidiaries, licensors and affiliates. You agree not to copy, reproduce, republish, modify or distribute any of the content on this website, without prior written approval of FREEL TECH. All rights reserved. The site contains corporate logos and other symbols used for identification that are either directly or indirectly trademarks of FREEL TECH and/or its subsidiaries, licensors and affiliates. The website may also contain trademarks to third parties. Any and all unauthorized use of such trademarks is strictly prohibited. FREEL TECH does not warrant that its pages or the server that makes them available are free of viruses or other harmful components. Any FREEL TECH’s documentation may include technical inaccuracies or typographical errors. Changes and additions may be made by FREEL TECH to any information contained herein. FREEL TECH reserves the right to change any information and content on this website or withdraw access to them at any time. FREEL TECH may at any time update, amend or make changes to this Legal notice. In this case, those changes will be prominently posted here. FREEL TECH may also deny access to this site without reason, notice and/or liability. FREEL TECH values your privacy. Therefore we operate this website in compliance with applicable laws on data protection and privacy, including the Terms and Conditions of the General Data Protection Regulation (GDPR), enforced since the 25th of May 2018 within the European Union. We collect personal data (may include but is not limited to: names, addresses, telephone numbers, or email addresses) in connection with the operation of our website only when you have voluntarily provided such data to us. As a general rule, we use such data only for the purpose for which you divulged the data to us, such as to answer your inquiries. We mainly collect data on potential partners for purposes of evaluation of a possible business relationship as well as development and management of existing customer and business relationships. We take great care in handling your personal data, so as to guarantee your safety and security, and we will never disclose personal data to third-parties without your consent and approval. We take reasonable measures to secure your privacy and to prevent unauthorized access to information that we collect online. Nevertheless, we cannot guarantee the security of your personal information. Our website may contain links to sites or services of third parties or other companies that have their own privacy policies. We recommend that you review the privacy policies of such third parties. FREEL TECH is not responsible for such third party privacy policies. We are entitled to disclose, process or use such data by virtue of permission granted by you, in compliance with applicable laws and regulations or by court order. This includes disclosure of personal data to third parties located outside the European Union or the European Economic Area. In such cases FREEL TECH will attempt to give you prior notice using the contact information you have provided. Should you require more information, please contact us via our contact us form (at the bottom of the website). We make good faith efforts to respond to all legitimate requests for information and when applicable we update, correct, amend or delete your personal data. IF YOU DO NOT AGREE WITH THIS POLICY, PLEASE DISCONTINUE THE USE OF THIS SITE.